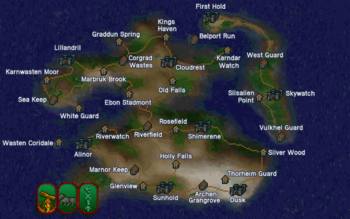 Summurset Isle is one of the nine provinces you can visit in Arena and the starting location for High Elf characters. It is a green and mountainous group of islands in the southwest of Tamriel, off the western coast of Valenwood. During the Main Quest, you will travel to the Temple of Mad God, as well as locate the fifth piece of the Staff of Chaos in the Crystal Tower. Alinor — A city-state located along the western coast of the largest island in Summurset Isle, west of Shimmerene and northwest of Sunhold. Cloudrest — A city-state located in northern Summurset Isle, east of Lillandril. Dusk — A city-state located on the southeastern coast of the largest island of Summurset Isle, east of Sunhold. Firsthold — A city-state located on the northern coast of the second largest island in Summurset Isle. Lillandril — A city-state located on the northern coast of the largest island in Summurset Isle. Shimmerene — A city-state located in the east-central area of the largest island in Summurset Isle. Skywatch — A city-state located on the eastern coast of the second largest island in Summurset Isle. Sunhold — A city located on the southern coast of the largest island in Summurset Isle. Archen Grangrove — A town located in southeastern Summurset Isle, east of Sunhold and west of Dusk. Belport Run — A town in northeastern Summurset Isle, northeast of Cloudrest and southwest of Firsthold. Corgrad Wastes — A town in northern Summurset Isle, east of Lillandril and west of Cloudrest. Marnor Keep — A town in southwestern Summurset Isle, northwest of Sunhold and southeast of Alinor. Riverfield — A town located in central Summurset Isle, east of Alinor and west of Shimmerene. Sea Keep — A town on the northwestern tip of Summurset Isle, southwest of Lillandril. Vulkhel Guard — A town located on the southern coast of the smaller island of Summurset Isle, south of Skywatch. West Guard — A town on the smaller island of Summurset Isle, north of Skywatch. Ebon Stadmont — A village in west-central Summurset Isle, southwest of Cloudrest and northwest of Shimmerene. Glenview — A village located on the southwestern coast of Summurset Isle, west of Sunhold. Graddun Spring — A village on the northwestern part of Summurset Isle, northwest of Cloudrest. Holly Falls — A village in southern Summurset Isle, north of Sunhold and southwest of Shimmerene. Karndar Watch — A village on the northeastern coast of Summurset Isle, east of Cloudrest. Karnwasten Moor — A village along the northwestern coast of Summurset Isle, southwest of Lillandril. Kings Haven — A village on the northern coast of Summurset Isle, north of Cloudrest. Marbruk Brook — A village located in northwestern Summurset Isle, east of Lillandril. Old Falls — A village in central Summurset Isle, south of Cloudrest. Riverwatch — A village on the western part of Summurset Isle, northeast of Alinor. Rosefield — A village in central Summurset Isle, directly west of Shimmerene. Silsailen Point — A village located on the smaller island of Summurset Isle, west of Skywatch. Silver Wood — A village located in southeastern Summurset Isle, northeast of Dusk and southeast of Shimmerene. Thorheim Guard — A village in southeastern Summurset Isle, northwest of Dusk. Wasten Coridale — A village located off the coast of Summurset Isle, west of Alinor. White Guard — A village in Summurset Isle, south of Lillandril. The map of Summurset Isle shows four islands. The large island, smaller island in the east, and two very small islands where Belport Run and Wasten Coridale are located. This page was last modified on 11 February 2019, at 00:07.